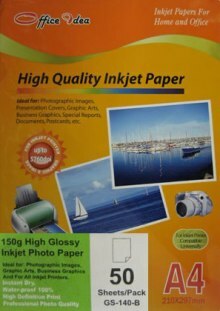 Opacity: 95% Brightness: 91% Bright white glossy paper ideal for photo reprints, photo proofs and contact sheets. For vivid photo quality with maximum colour saturation produces vibrant colours and razor sharp text. Superb photographic image quality output with a instant dry. Widely used for various brand colour inkjet printers.